What is 'Language Dancing' and Why is it Important to Parents? In the 1980’s, two research psychologists, Betty Hart and Todd Risley, asked why kids from low income families, despite the gains they made in Head Start, were unable to close the achievement gap with children from more advantageous backgrounds? To find out, they decided to investigate what happened in families before preschool. First, Hart and Risley discovered a huge range in the amount of parent talk between the families. Children of “talkative” parents heard almost 45 million words spoken during their first three years, while children of “taciturn” parents heard about 13 million words—a gap of over 30 million words. The chart below shows the word exposure in each group. Though there were talkative and taciturn parents in all three groups, overall, professional families were much more talkative than the other two groups, and working class families were more talkative than low income families. Second, Hart and Risley discovered in the parent-child interaction two kinds of talk with significant effects--"business talk" and "extra talk." Business talk referred to ordinary instructions to children, like "Eat your dinner," "Brush your teeth," or "Time for bed." Hart and Risley named this extra talk language dancing. Their research showed that in the three family groups business talk took the same number of words, about 600 per hour. So, for children to hear more words than that, parents needed to engage in language dancing. This was the difference. The additional 30 million words spoken in professional families were the chatty, language-rich kind. Third, Hart and Risley discovered something startling in the measurements on “Feedback Tone,” a count of encouragements and discouragements heard in parent-child interactions. Children in professional families heard 500,000 encouragements compared to 80,000 discouragements. Children in low-income families heard 80,000 encouragements compared to 200,000 discouragements. The data showed that business talk naturally included more prohibitions and extra talk more encouragements. So the extra talk provided not just exposure to more words, but also to more encouragements. The extra talk of low-income parents had just as many encouragements as professional families. But because they didn’t engage in much extra talk, their ratios of encouragements to discouragements were meaningfully different from working class and professional families. The data, published in their book Meaningful Differences in the Everyday Experience of Young American Children, showed a surprisingly high correlation between the amount of “extra talk” children heard, their IQ scores (.78) at age 3 and their standardized tests scores (.77) at age 9. Even more surprising was that the most powerful of extra words were the ones spoken in the first year, before the children could even speak. When you hear these results now, you think, didn’t we know this? That’s what makes the study so remarkable. Until these results came out in 1995, no one really understood the cognitive advantages imparted by the sheer quantity of words children heard in their first three years of life. Most parents know that reading to kids is essential preparation for Kindergarten. Hart and Risley’s research helps explain why that’s true. Reading is a kind of language dancing. What about television? Unfortunately, words spoken in the background don’t wire-in the same effects as language dancing. So televisions can't be a source of extra talk. As you can imagine, this research has great relevance to social policy and educational interventions. Since this study, neuroscientists have discovered more about critical language learning periods in early childhood. Hart and Risley believe their research makes a compelling argument to policymakers to invest in programs that inform parents about language dancing. 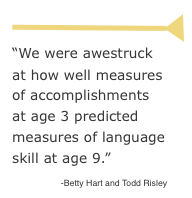 The Early Catastrophe: the 30 Million Word Gap, by Betty Hart and Todd Risley, is their original summary of their research. Todd Risley discusses this research in an 8 minute video interview. At the end he says, "We think we have got at what's at the core of social economic status and child achievement." Quite a statement. David Shenk, author of The Genius in All of Us, a PCM Top 10 book for Parents, published this article in The Atlantic, The 32 Million Word Gap. It's an excerpt from Chapter 2 of his book. Explains Hart and Risley's research in the framework of contemporary thinking about genetics. This Ted Talk by Patricia Kuhl, The Linguistic Genius of Babies, is an eloquent and fascinating presentation of critical periods of language learning for babies. The babies in science experiments are adorable, and you'll learn a ton in 13 minutes.